The permit lasts for period of collection specified. It is an offence to promote the collection without first obtaining a Permit from the Council. Only one Saturday per year can be allocated to each charity. The application form should be completed and forwarded to the Legal Section. 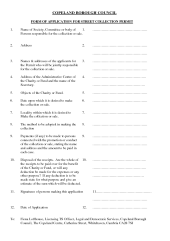 The return form must be submitted to the Council no later than one month after the collection date.